Tax Repatriation: Don’t Go There! It seems like bad ideas just keep gaining strength these days. 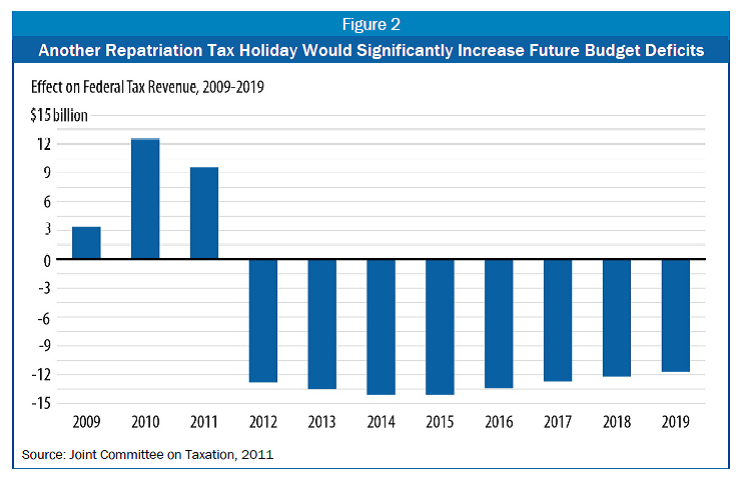 I’m talking about the tax repatriation holiday I wrote about last week, a great way to give a fat tax break to multinational corporations while adding $80 billion to the deficit over 10 years. To remind you, this is where we let American companies with overseas earnings bring those earnings back at a sharply reduced tax rate. As Chuck Marr and Brian Highsmith summarize, it was a total flop the last time we tried it. So why does this idea have any oxygen at all right now? Because some congressional Democrats who would normally run from it are intrigued by an idea floated to use some of the money that comes back from abroad to capitalize an infrastructure bank. I like the infrastructure bank idea—it’s a cool way to make smarter investment decisions. But here’s why this is the wrong way to go about funding it. –There is no “money that comes back from abroad.” The graph below shows the real story on the “proceeds” from the tax break. The Treasury collects some money up front and then starts losing big time. Why? –Because if companies with “overseas earnings” (these quotes are important, as I’ll explain next) learn that they can depend on a big tax break every few years, they’ll shift more and more earnings and jobs and investments abroad. To amplify this incentive has to be one of the craziest things we could in an economy that desperately needs those earnings, jobs, and investments here at home. –Here’s a new kicker I learned from my CBPP colleague Brian Highsmith today, based on some excellent reporting here. Much of these “overseas earnings” actually start here—they’re shifted abroad to take advantage of lower tax rates and to defer them in hopes of…you guessed it!…another fun repatriation holiday. –But if we don’t give them what they want, won’t they just defer ever more earnings?—at least this way they’ll bring some of them back. I don’t buy it. Again, it’s really the reverse—this just proves to them that they should start aggressively deferring again in preparation for the next holiday. But let’s say they do bring back fewer earnings than they otherwise would. That’s not necessarily a bad deal for the Treasury, which would be taxing a smaller amount at a much higher rate. If the rate differential is 25% versus 5% (ballpark for what they’d pay without and with the holiday), they’d have to bring back five times less earnings for the Treas to lose on this. Based on historical revenue flows, that’s very unlikely. –And finally, basic fairness. Why provide a massive windfall and give a big competitive advantage to the very companies that have already shown that they can handily produce abroad, or at least make it look like they can, ala the Bloomberg link above? Except for the phony tax-haven stuff, I have nothing against the multinationals…hey, I get that it’s a global economy…Tom Freidman and all that. But can someone give me one good reason to favor them over our domestic producers?!? Believe me, I know how hard it is to find the money to fund good ideas like the I-bank, and I understand why policy makers who’ve tried to move that idea for years might view this as a bright opportunity in an otherwise dark time. But there’s just gotta be a better way. Maybe something off of this list, for example (hint: “I’ll take ‘international tax reform’ for $129 billion”). Share the post "Tax Repatriation: Don’t Go There!" 10 comments in reply to "Tax Repatriation: Don’t Go There!" Repatriation would allow these corps to pay large dividends to their shareholders, as they did in the last tax repatriation holiday. Given that the vast majority of shares are held by the top slice of wealthy Americans, this would be yet another benefit flowing to the rich and powerful, at a time we’re cutting benefits to the middle class and poor. You gotta problem with this sort of redistribution of wealth? I entirely agree, but I might state things a little differently. First, though, I consider all of the following stating of the obvious, starting with “I’m not an economist,” in case any of this is wrong. On the I-bank idea. To the extent that I understand it, I wouldn’t call it a “bank.” I’d call it a “publicly owned corporation.” A publicly owned infrastructure corporation. A corporation whose product is infrastructure, and whose revenues and profits (if any) are both public. Publicly owned production, as in socialism. My point here is that I think some see it as a good idea because it seems to be making a government function look more like capitalism by calling it a “bank.” If it does nothing but subcontract projects out to private companies, that doesn’t change anything at all; companies do that all the time without being banks. No matter what it’s called, it’s not capitalism unless it gets privatized; it’s socialism. But it does matter what it’s called, since calling it a “bank” confuses the issues. Someone will suggest privatizing it as a bank, but it’s not a bank, it’s a corporation that does infrastructure – infrastructure that private companies generally are not or do not want to do on their own, but that sorely needs doing. “Earnings” are corporate profit, not (corporate) revenue, right? Corporate taxes are on profit, not revenue, right? Private corporations can do whatever they darned well please with their profits, because they’re private property, right? Not so for publicly owned corporations. When corporations are publicly owned, their corporate profits are public revenue, just like tax receipts are public revenue. That’s socialism. And it’s a good idea – it’s the infrastructure funding idea, unless I’ve got it really wrong. See where I’m going with this, JB? There’s no difference in my view between lower corporate tax rates and corporations being able to avoid a corporate tax rate by offshoring production and thus accounting of revenues and profits, so as to avoid higher rates. But the obvious part is what they did do, and generally would do, with their profits: it goes to shareholders, not to operating expenses, which is what jobs are. Operating expenses are costs, not profits. Socialization – public ownership – of offending corporations has to be part of the solution, if anything at all is done, in my view. But once that’s understood, I think there are various ways to structure solutions. What is not a solution is allowing corporations to avoid public responsibility, not just to the US, but to any of the countries in which they operate. And by now, many of them are financially bigger than many whole countries. And we’ve allowed them to become so large by turning capitalism into a religion and rejecting out of hand anything that might be described as socialism. BTW, JB, so you’ll know where my ideas are coming from. I’m not a Marxist; I’ve not read, let alone studied, much of Marx. And I don’t intend to read or study Marx, any time soon. Nor should I or anyone else have to – this is really, really, really basic stuff. When economists start learning and understanding computer science (beyond totally abusing ideas like the Turing test like they’re now doing), I’ll take seriously the idea that I need to study Marx to be a socialist. No; I have two primary sources for my socialism: dictionary definitions and the New Testament. Neither says anything about, e.g., central planning or atheist authoritarianism, or anything remotely like those things. And economists who want to make “slippery slope” arguments really need to look in a mirror. It seems to matter more whose an idea is, than what the idea is. When everything is filtered in this way, there’s no longer much possibility of thinking or speaking plainly and clearly so as to be broadly (as in politically) understood. So homey ain’t tryin’ a play all dat. I would think that, after a while, all the sand – as in ostriches with heads in – would be getting a little hard to breathe. You got this exactly right. Many of us knew this was a terrible idea when Sen. Boxer proposed it the last time, arguing that it would encourage more off-shoring and hopes for another holiday. Sure enough! Ending the deferral of taxation on overseas profits is the right way to bring in income tax revenue for an infrastucture bank. I may have noted this before, but it is odd that the GOP speaks about how incentives operate and then ignores their own teachings and ideology about it. Jared- I saw on Wikipedia you have no formal training nor education in economics? Is that true- it says you were a music major in college? I was a music major in college but later got a PhD in Social Welfare. This program, at Columbia Univ, allowed you to choose a discipline through which to study social issue, and mine was econ. I even did an econometric dissertation: The Determinants of the AFDC Caseload: A Time-Series Cross-Sectional Approach, nominated for Association of Public Policy and Management’s best dissertation of the year. In 2004, Carrier Air Conditioner went through intensive discussions with the Gov. and US Senators from NY that tax breaks and other incentives could not overcome the cost of doing business (wages, regulation, local, state and federal taxes) in the United States. Carrier executives clearly made their case for moving their operations so Carrier could be competitive in the global market place. Does it not amaze you, that the PRC has evolved from a Marxist economic system to capitalist systems in such a short time? PRC is projected to have the largest GDP by 2020 or earlier. How many more Green companies will have to be funded by the US Energy Dept. before somebody realizes that the US cannot compete in the global market place?